Colin Kaepernick first protested against racial injustice and police brutality by kneeling down during the United States national anthem in the summer of 2016. Since then, a whole movement has grown around that gesture, which has led to a negative backlash against the NFL and exposed corruption within the corporate giant. Kaepernick is kneeling to shine a spotlight on the deeply divided America in which law enforcement will protect some people and choose to execute others. This quiet protest exploded onto the world stage when President Trump weighed in on the matter urging the NFL to fire him. The movement and Kaepernick’s grievance against the NFL and its owners exposes a prevalent hypocrisy in the NFL. According to the NFL's own Personal Conduct Policy, "it is not enough simply to avoid being found guilty of a crime. We are all held to a higher standard and must conduct ourselves in a way that is responsible, promotes the values of the NFL, and is lawful." To date forty-four players accused of sexual misconduct or domestic abuse are still employed by the NFL, while Kaepernick, who has not ever been accused of any crime (other than kneeling), remains unsigned. I made this artwork The Gladiator because I see Kaepernick as a person of integrity who would rather stand, or in this case, kneel for an ideology based on justice, equality, and positivity rather than get a fat paycheck working for a corporation that values none of those things. 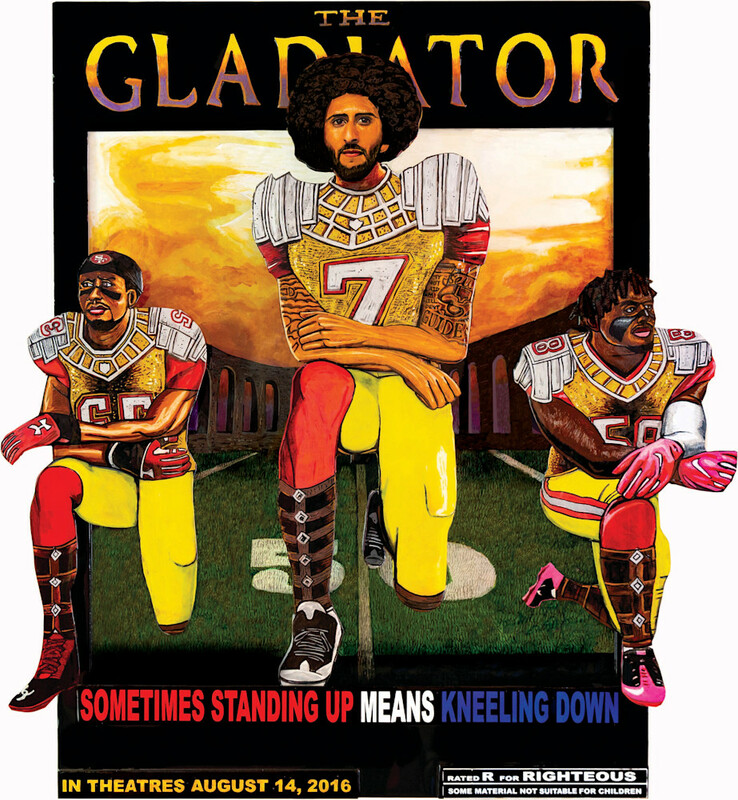 I chose to depict the afro-clad Kaepernick in my work, because I felt it had the closest visual connection to the halo of saints that appear in classic religious paintings. As this drama is being played out on the world stage I chose to have him kneel on a combination football field (50 yard line) and the Roman coliseum where gladiators played blood-sport for entertainment—hidden behind him is a golden goal-post. Flanked on either side of the centrally placed Kaepernick are his teammates who served him both on the field and metaphorically as his guardian angels. Finally, the artwork The Gladiator makes the declaration: “Sometimes Standing Up Means Kneeling Down” and is rated “R” for Righteous. Amen.